The Count of Monte Cristo is a swashbuckling, cracker of a novel. I would not normally have chosen to read a book as long as this (1462 pages) or as old as this (published 1844-45) but I was compelled to do so as it was the choice of the book club that I belong to. And I wasn’t disappointed. The story starts of on a happy, high note in 1815 with the French hero, Edmund Dantès, just having come back to Marseilles from a successful sea voyage. He is a sailor and about to marry the love of his life – a beautiful, fiery Catalan maiden. However, a trio of dark forces, in the form of a colleague, a romantic rival and a prosecutor, contrive to use him for their own ends and advancement, and poor Edmund ends up in jail for life, confined to a dungeon. There he meets the Abbé Faria, who educates him in languages, geography, science and culture. The Abbé tells him of a vast fortune hidden on an island and the two conspire to escape. After fourteen long years, Dantès alone manages to flee his island prison and find the treasure, making him the custodian of unimaginable wealth. He styles himself the Count of Monte Cristo, and over a ten-year period he tirelessly and single-mindedly pursues revenge against the three people who ruined his life. He manages to do this through an ingeniously contrived plot, helping other people along the way and finally finding love himself. 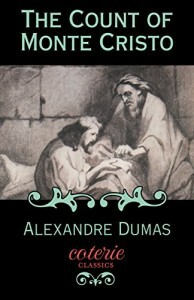 The character of Edmund Dantès changes throughout the book. In the beginning he is an ethical man with strong principles and the ambition to marry his love and provide for his elderly father and live a happy life. Once he is out of prison and assumes the personage of the Count of Monte Cristo he becomes cold and vengeful and seemingly lacking in sentiment. Towards the end of the story he begins to regret the lengths he went to in his pursuit of revenge and questions his conviction that he was justified in destroying the lives of his three enemies. When the book was originally published, it was serialised; hence its 117 chapters and the fact that publishing took place over two years, 1844-45. 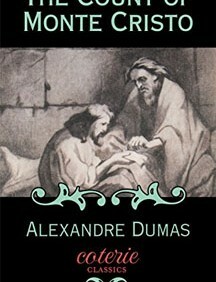 Dumas skilfully maintains tension throughout the book, which builds to a thrilling climax. I could barely put it down near the end. The book was originally written in French but the English version flows smoothly and the language is not jarring or clunky. The book is as entertaining now as it must have been 170 or so years ago when it was first published. There is a wonderful audio version from Librivox, narrated by David Clarke, which is free. David Clarke, with his repertoire of accents, makes the book come alive. The Kindle version costs $1.13 (about R15). I bought my paperback version from Exclusive Books for R257.